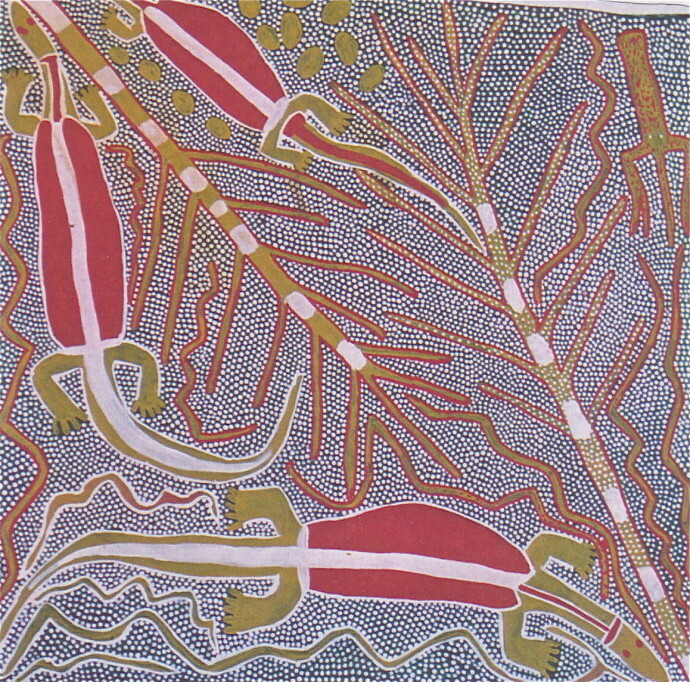 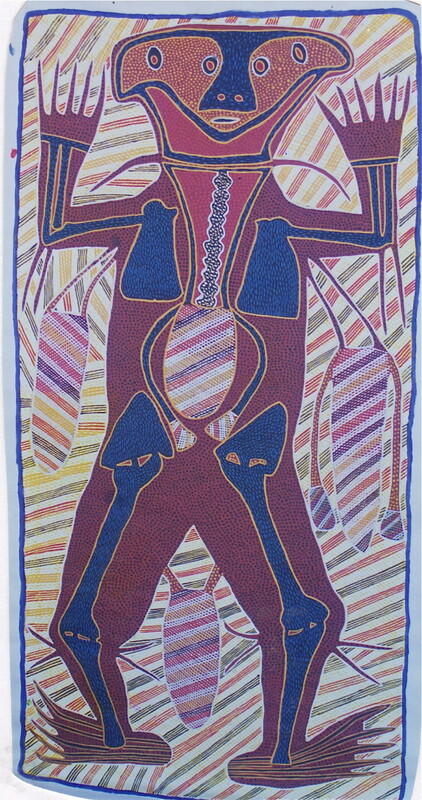 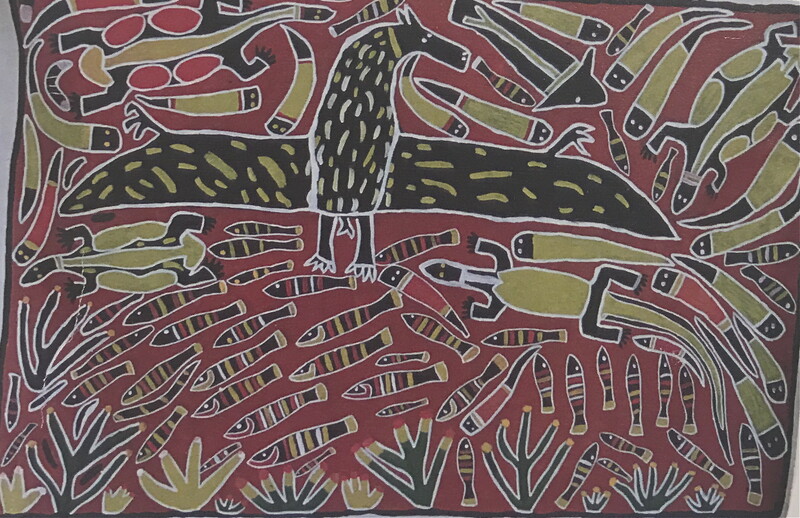 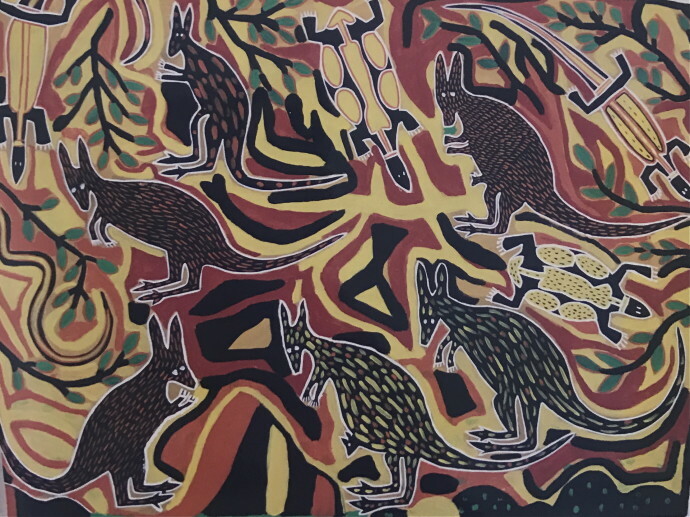 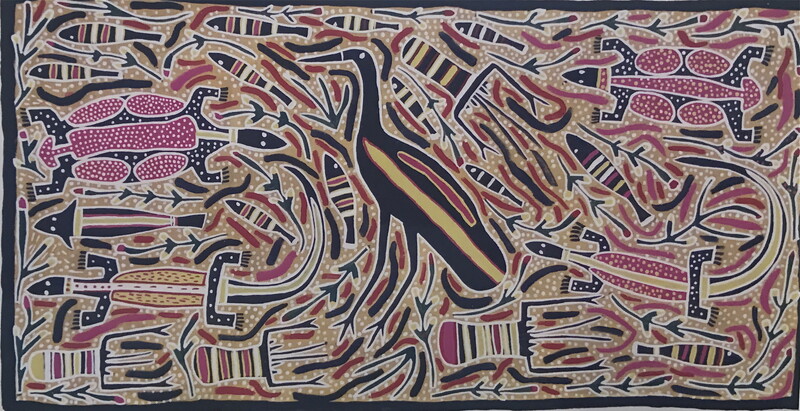 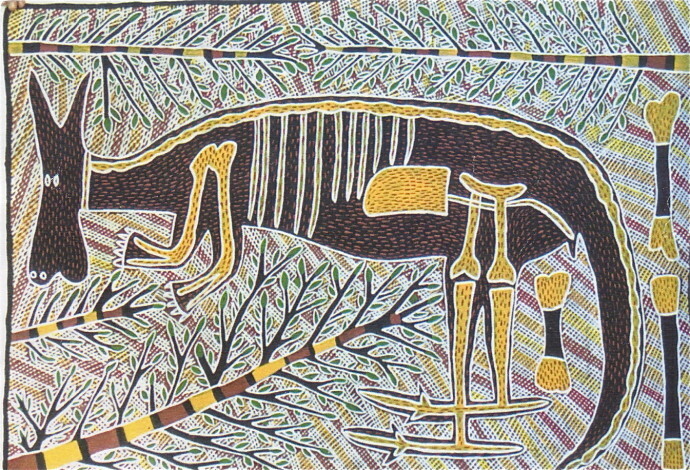 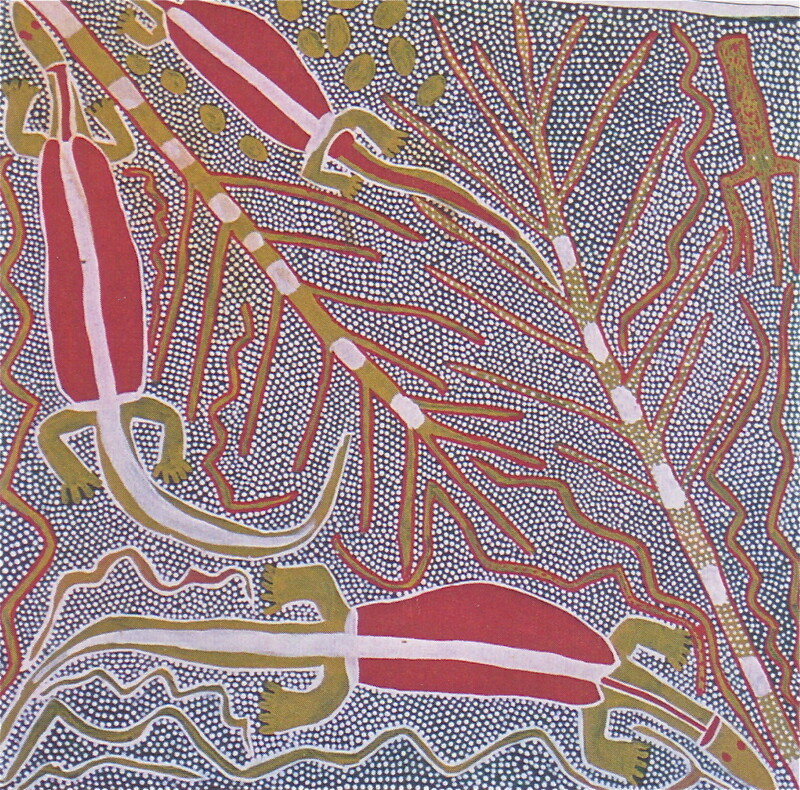 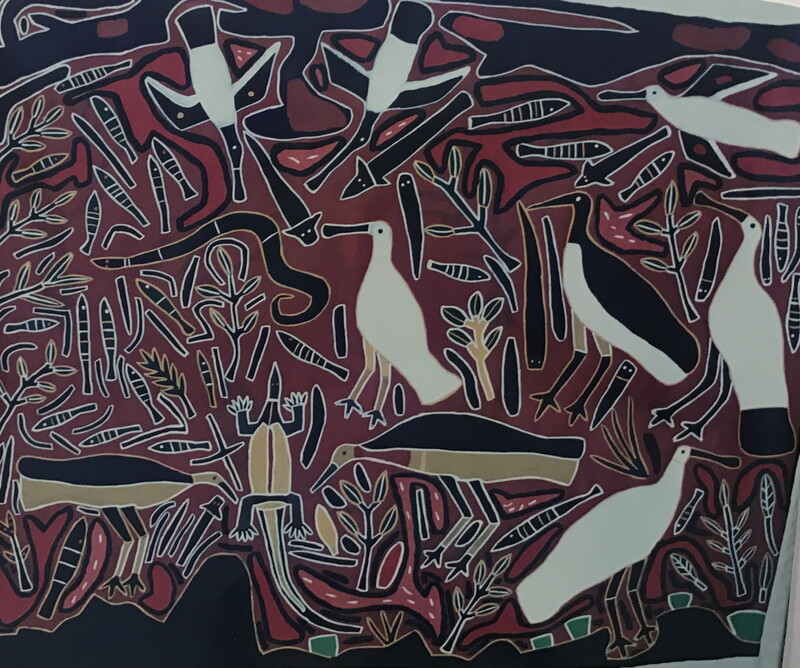 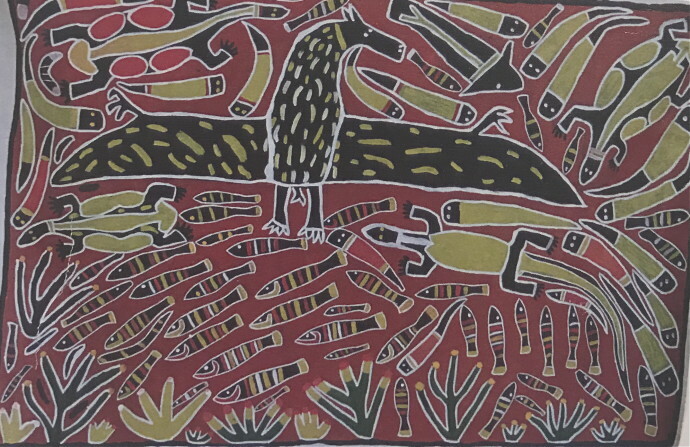 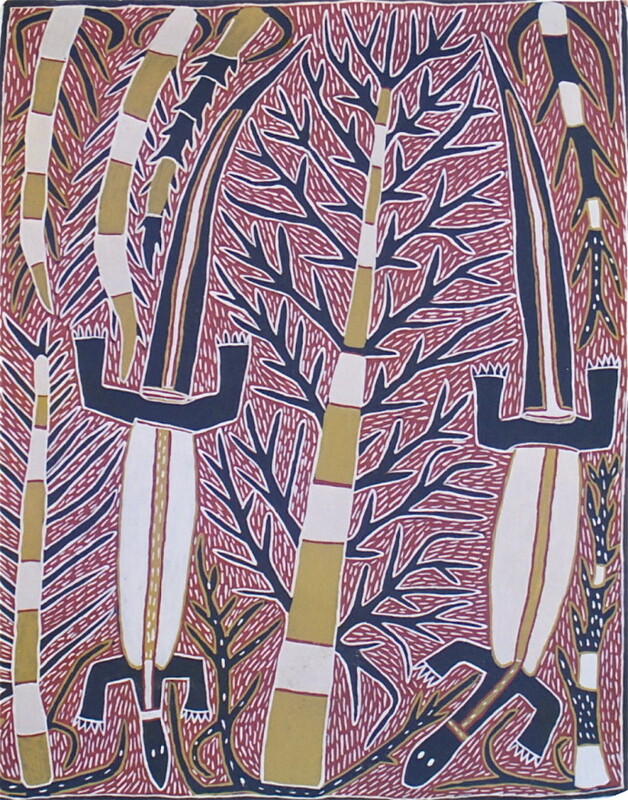 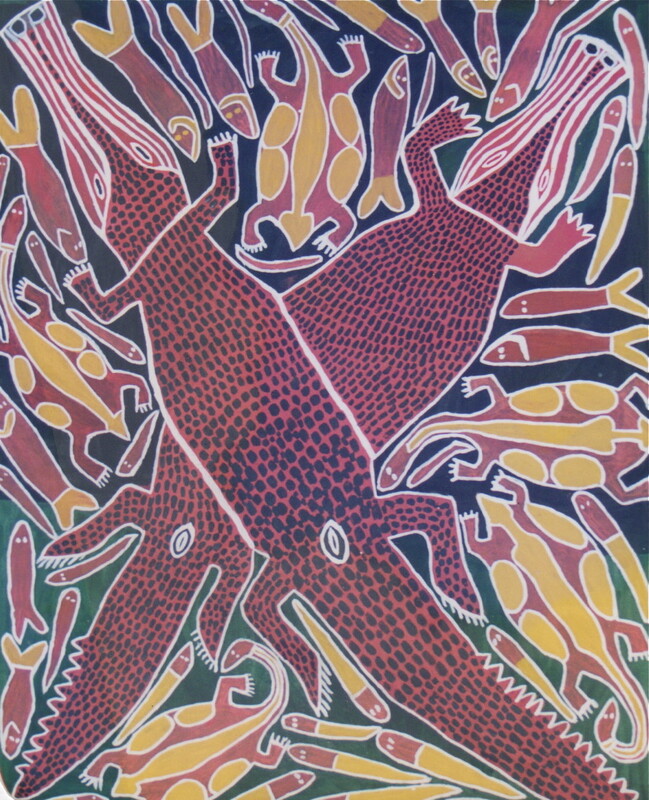 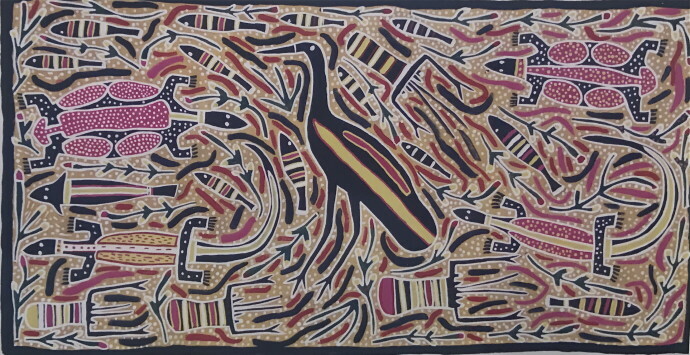 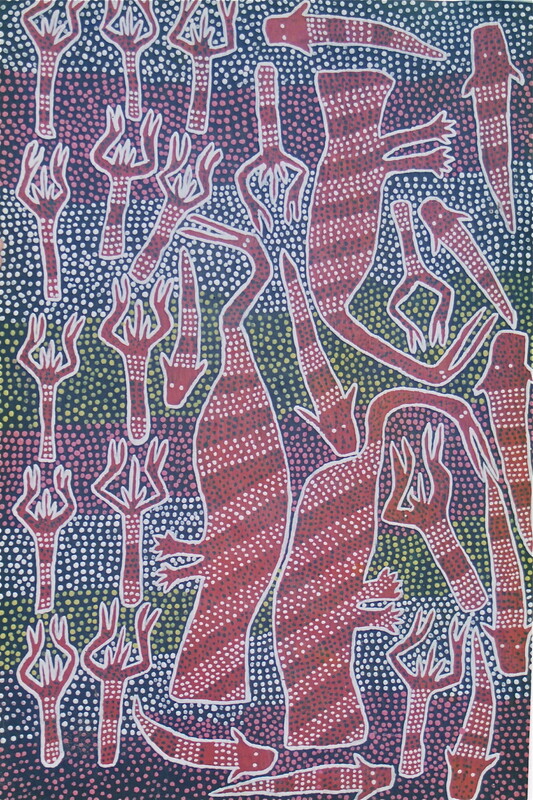 Sambo Barra Barra is one of the great originals of the Aboriginal art movement. 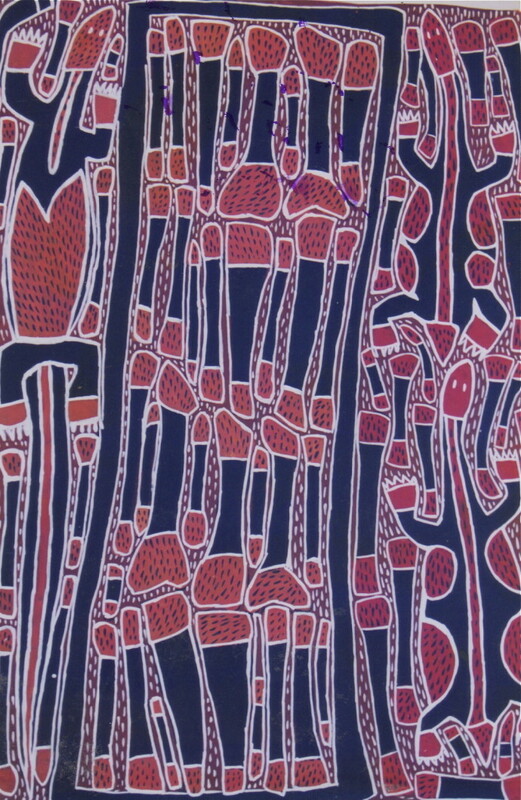 His style is immediately recognizable and instantly engaging. 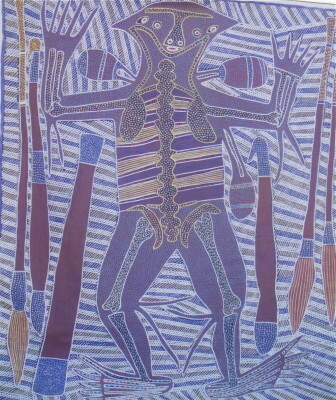 Barra Barra is one of the senior artists from Ngukurr in central north Australia. 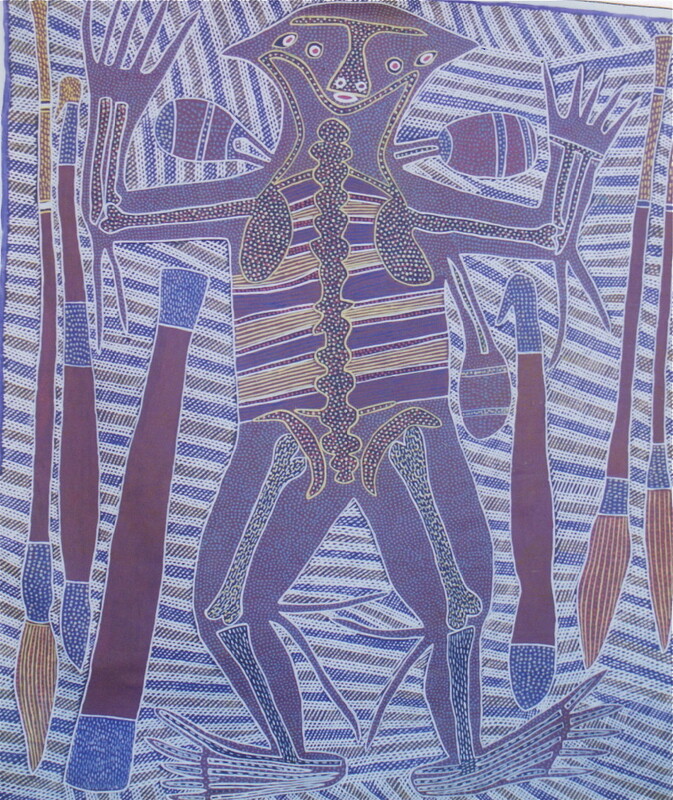 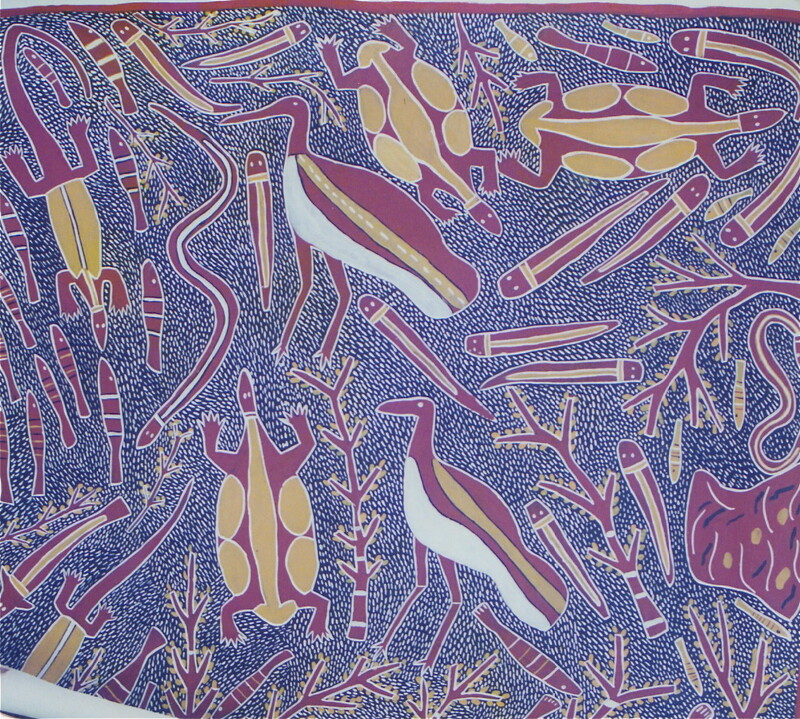 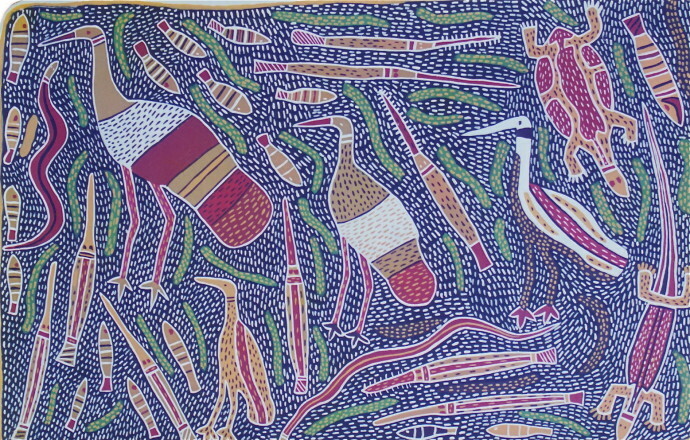 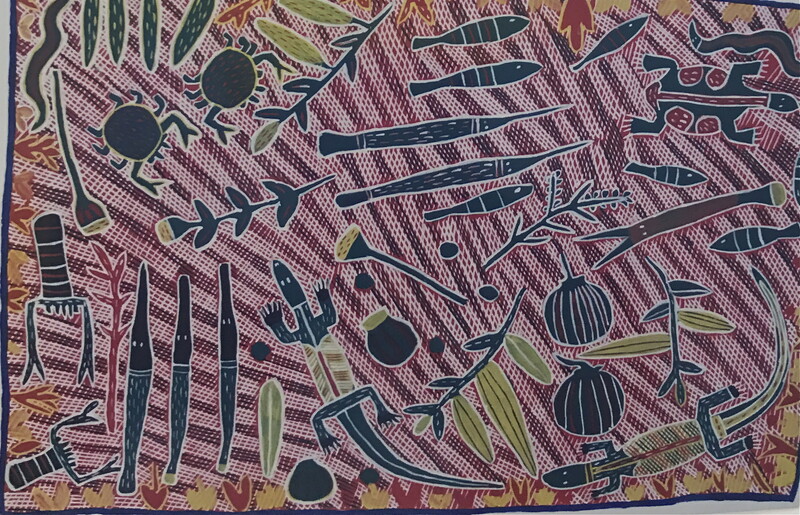 Of all the Aboriginal communities, Ngukurr is perhaps the most artistically vital and diverse. 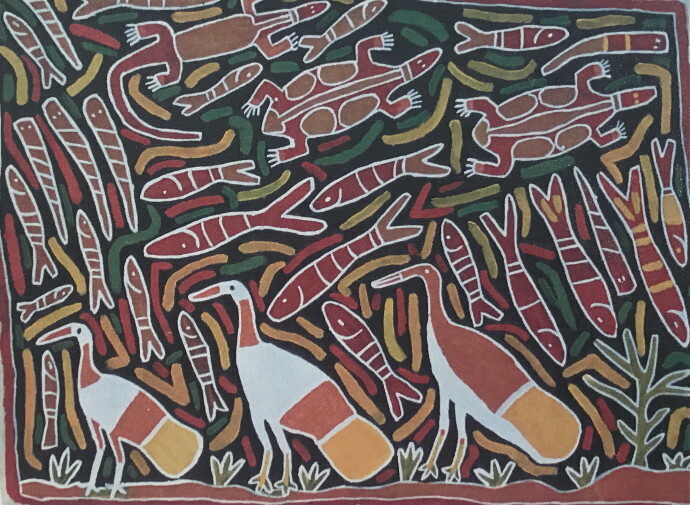 Although one of the last communities to take up painting (the movement did not begin there until the 1980s), it has developed with great force and direction. 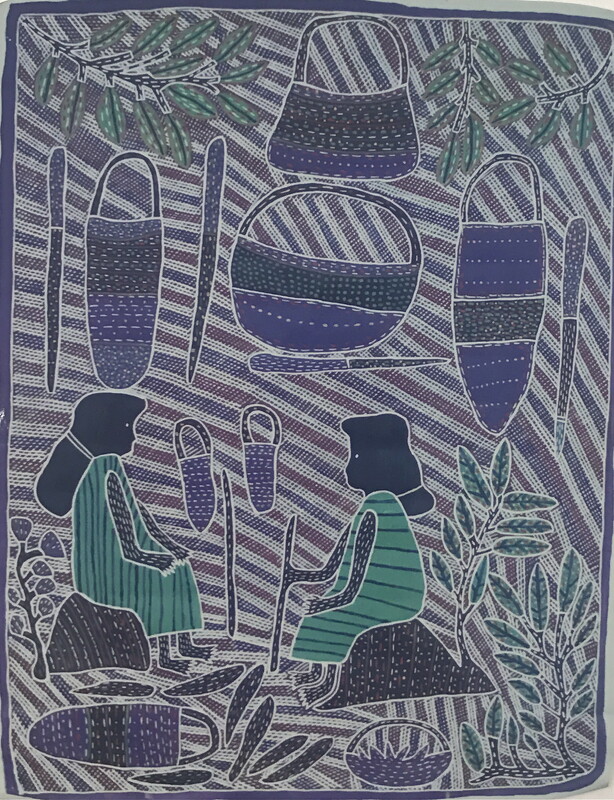 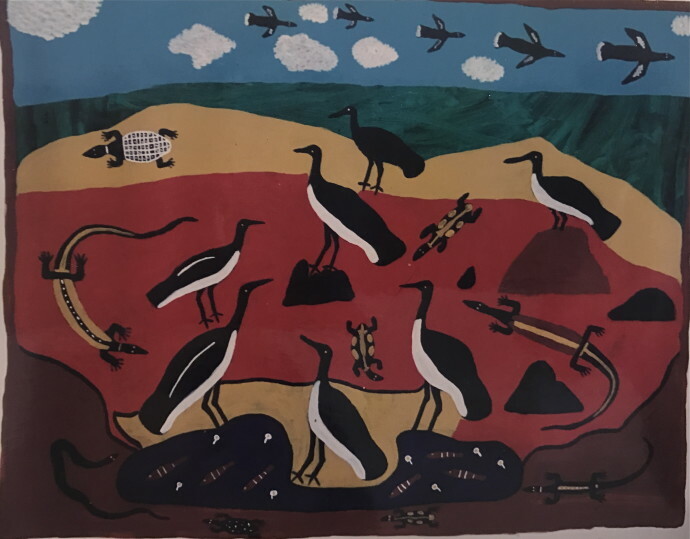 It is the homeland of several leading painters, including Gertie Huddlestone and the “Joshua Sisters”, Ginger Riley, Willie Gudupi and Moima Willie. Amongst these great artists, Sambo Barra Barra stands as a unique and powerful voice, at once novel and ancient. 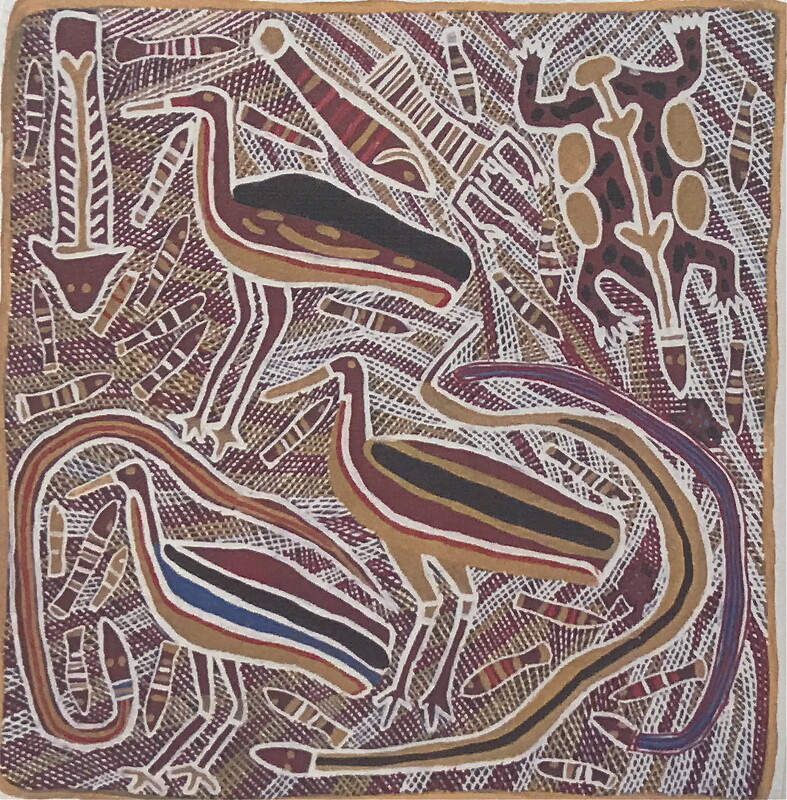 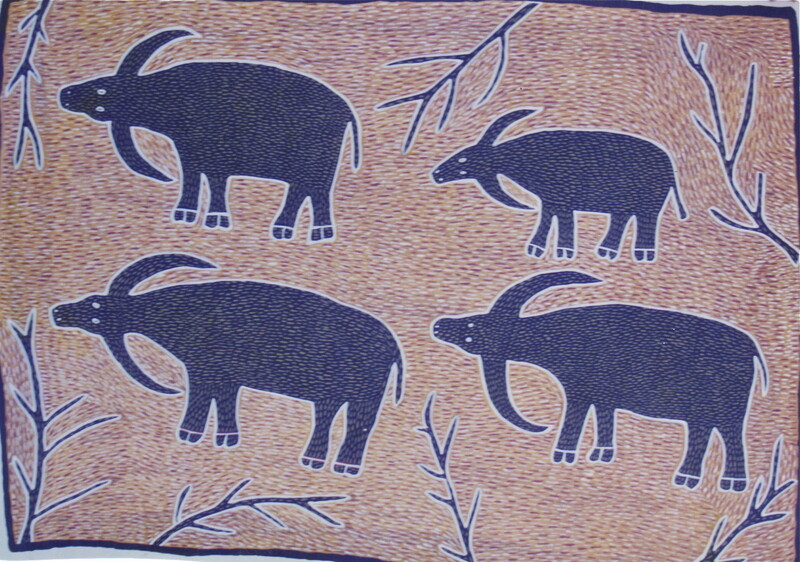 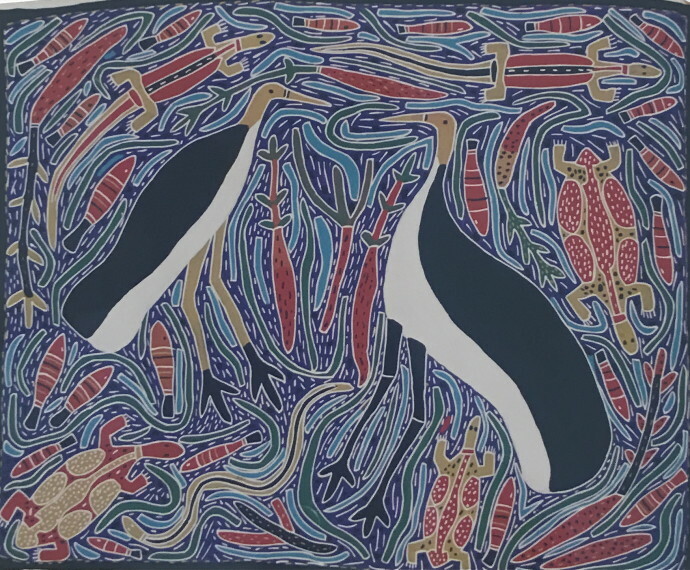 His art is steeped in the ceremonial and the natural life of his country. His favored subjects – constantly refreshed and reworked – are his totemic animals – crocodiles, buffaloes, giant lizards – and rich spiritual narratives, often involving the journeys of his distinctive “Devil Devil Men”. 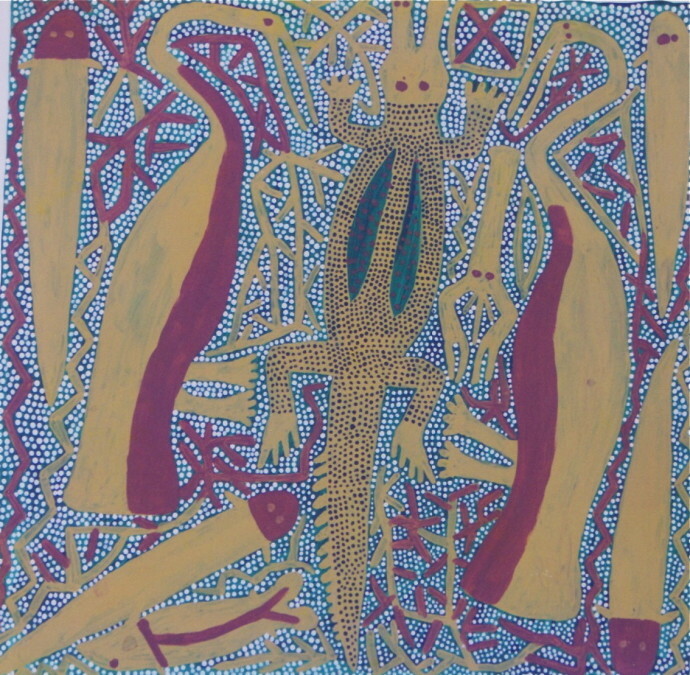 Barra Barra’s style is daring and original. 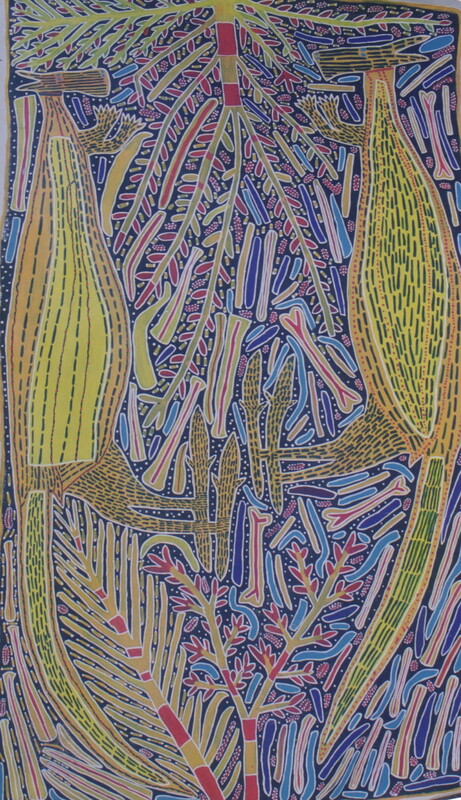 His compositions are bold, his detailing exact. 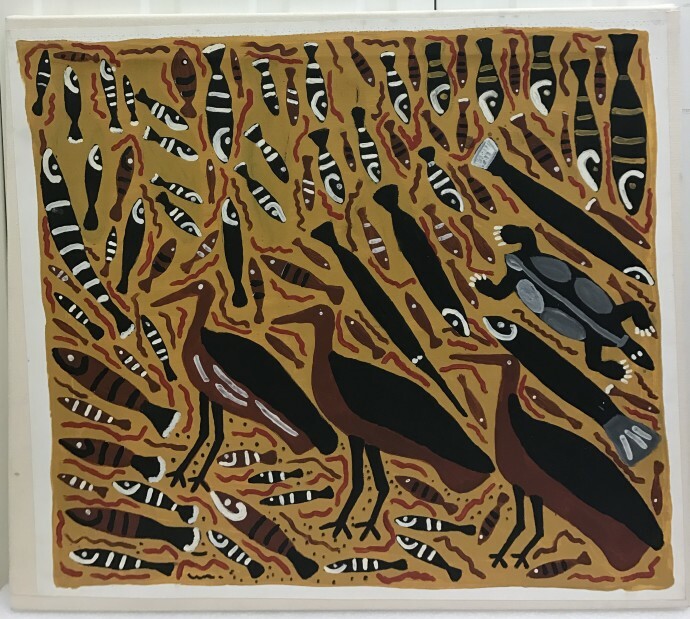 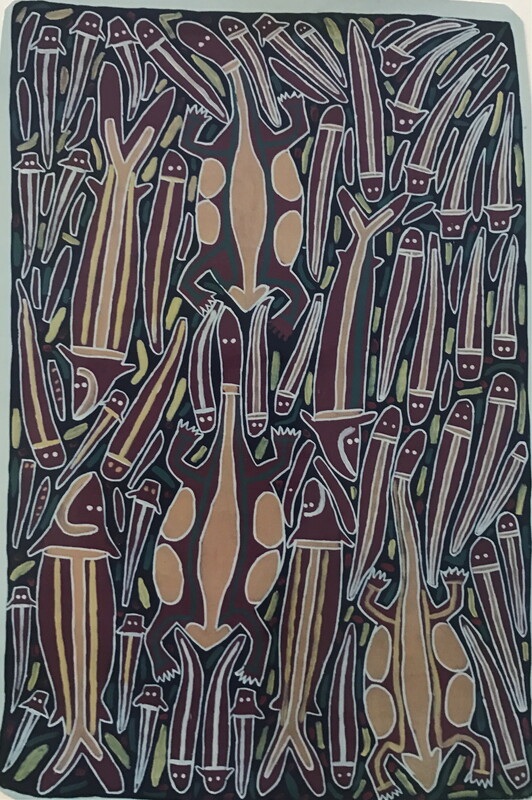 Although he trained as a bark painter and still employs the distinctive tropes of the Arnhem Land bark-painting tradition – cross-hatching, mixed perspective and ‘x-ray’ vision – he has, like most Ngukurr artists, adopted acrylic paint and canvas. He uses the new medium with extraordinary exuberance and control, setting off bright, contrasting colours within fine white outlines. Sambo Barra Barra is represented in the Australian National Gallery, and many of the state galleries, and also in private collections in America, Europe and Australia. 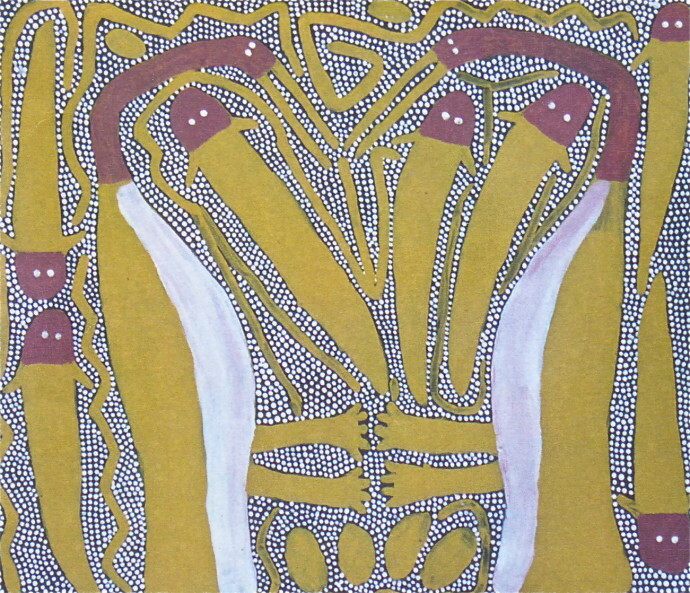 This is his first one-man show outside Australia.